i can now see the beckoning light from the end of this series of our melakan roundabout. thankfully! it has been almost four months since breinn and i made a weekend trip to malacca during the chinese new year holidays. cheesy as it might sound but by looking at the pictures, our trip seemed to be just only yesterday! although what we had wasn't a total experience of malacca because most of the shops were closed for the holidays. we only had to contend with the very few remaining shops that opened their doors for those like us, who were resolute to stay in malacca in the midst of their new year celebration. malacca by the way, has a significant number of chinese populace that constitute a huge part of its culture and history. but no regrets just love err enjoy? well, that's quoting katy perry. seriously though, breinn and i consider our melakan experience an important pinned post on our imaginary travel board. i was famished by the time we reached malacca at past noon and i presumed breinn had enough energy to still drag his feet longer than me. after all, he had an entire peanut butter sandwich all by himself! this was the only opened shop that was caught within our narrow peripheral vision that time. even more narrow because of the heat that was coupled with my pressing hunger. 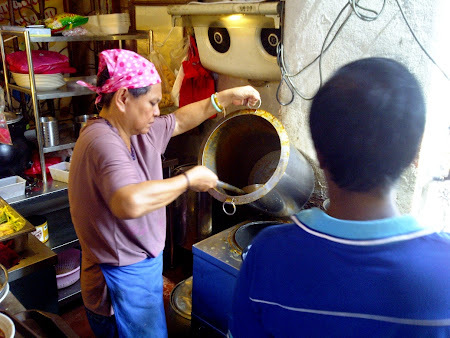 the crowd here appeased us that the food was okay and we simply thought that this could be the "it" hole in the wall in malacca. i was supposed to order a noodle in laksa but by the time it was my turn to engage a hasty conversation with the noodle lady, they then ran out of the laksa soup. Bottoms up for the laksa! 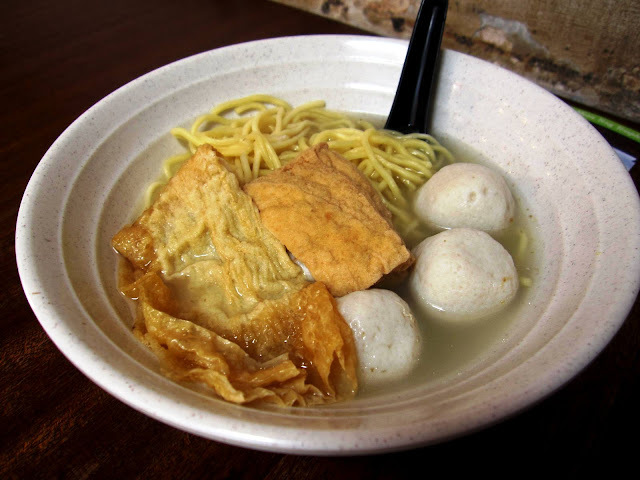 laksa is a a kind of noodle soup from peranakan culture (chinese and malay mix). it has various spices and it's even enriched more with coconut milk. that time, i thought my stomach could withstand whatever laksa had to offer but unfortunately, it was a sold out. 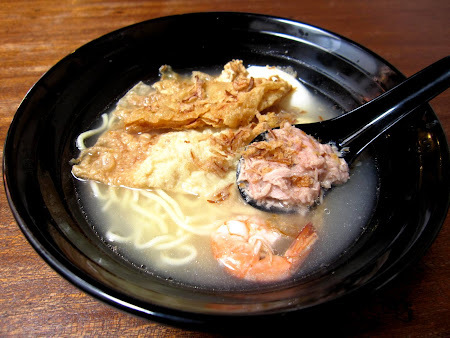 so i settled with seafood soup noodle instead, which the canned tuna had fulfilled majority of the soup's promise to be a seafood. of course, there's that shrimp who got lost from its pack like bill and will, the two incorrigible shrimps from happy feet 2.
this is what breinn had. sadly, this did not get to his standards of a decent food and he's even far too picky compared to me. i could eat something unappealing if left with no other choice but this one also didn't satisfy my indiscriminate taste buds. it could taste good if there's a real fish fillet in it. our soup noodles had the same soup base because it came from this gigantic pan. what sets each noodle different from the rest is what kind of ingredients as per the entire noodle name. these ingredients are adeptly handpicked by the noodle lady right into your noodle soup. voila! your noodle soup is done in a matter of seconds. there's the "++" in the price in case you opt to put other ingredients. i would have liked to put some greens on my noodle but with all the rush and the pressure of a mandarin conversation, i got tongue-tied. 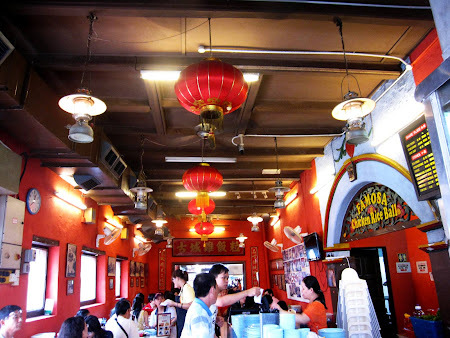 with breinn's noodle aside, we very much welcomed the authentic atmosphere of a noodle shop in malacca. for a moment, a chinese action movie flashed across my mind after seeing such scene above. can you also imagine tables overturned and noodle soup gone to waste as the hero tried to fight a hundred men? or maybe it's just me, the plain weird me. 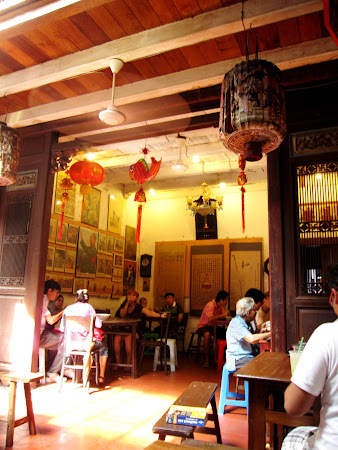 jonker 88 is located of course in jonker street, sitting alongside mr. universe. 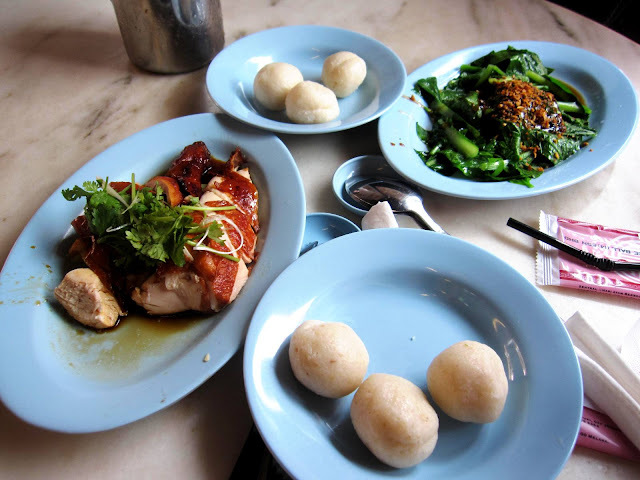 famosa chicken rice ball is somewhat touristy because it's raved all over the internet that it's a must try. anyhow, so try we did. 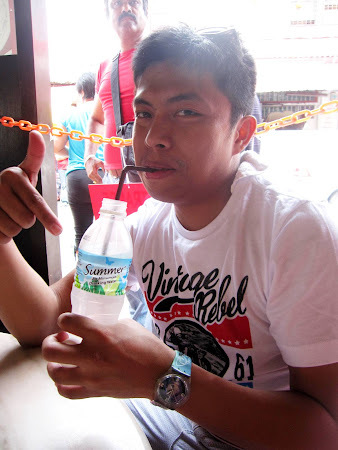 breinn was delighted with his bottled water that came with a straw! paying attention to what he's pointing, the weather that time definitely spelled summer! i can say to myself that all my senses have almost settled in singapore because i was able to finish off a grand serving of what we ordered. because back home, i'm used to food with strong flavors courtesy of salt, soy sauce and various monosodium glutamate (msg) mix. 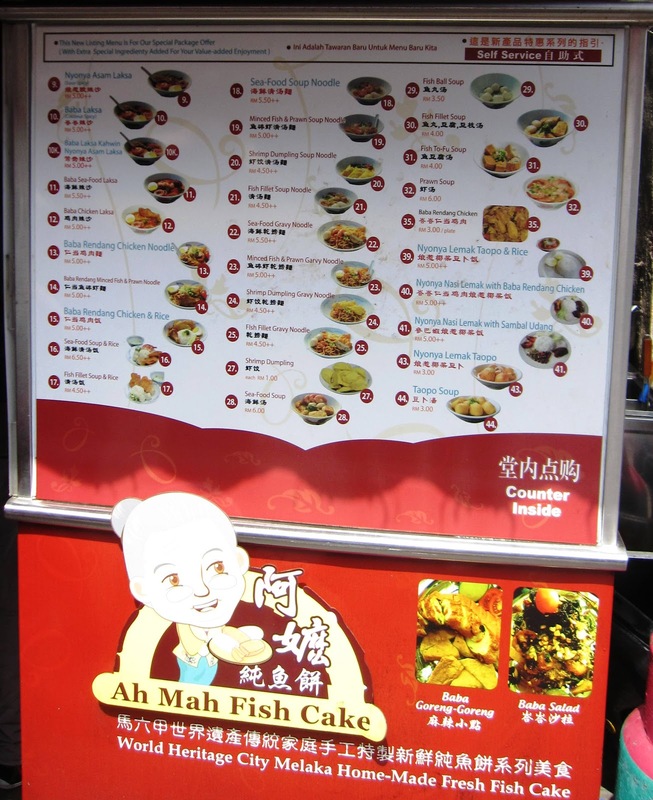 when i had my first attempt of the food in the little red dot, my taste buds screamed blandness but gradually, my taste buds adapted. 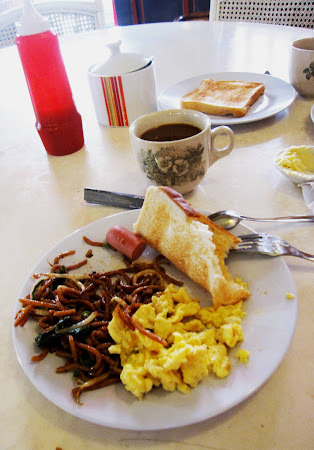 what we had in famosa were like the food that i had in singapore so i was able to finish my fill on my lunch with not much care. breinn on the contrary, filled the remaining space of his stomach with water even trying to reason out that the weather was too hot. he had his doubts on how the chicken balls were made because they were salty and i explained to him that it was the chicken broth. nonetheless, he already put down his spoon and fork and continued sipping his water. this was breinn's plate where a western breakfast married to a peranakan breakfast. the auntie who prepared the food was very amiable. she wore a friendly smile that could certainly brighten up anyone's day. 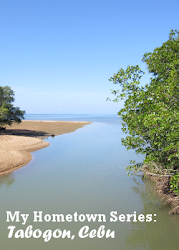 this is now a very lengthy post so i won't do another narrative about the geographer's café because it's already here in this post. 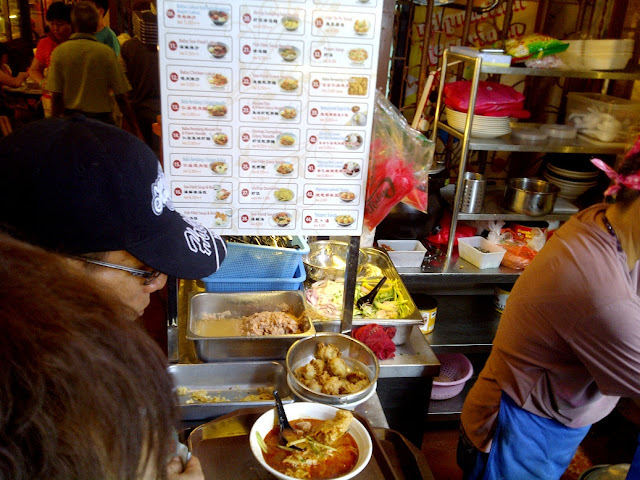 though we might not have tried the other peranakan food and the famous cendol which i believe, it's like a halo-halo at home, thinking alone about the food above surely brings us back to malacca.